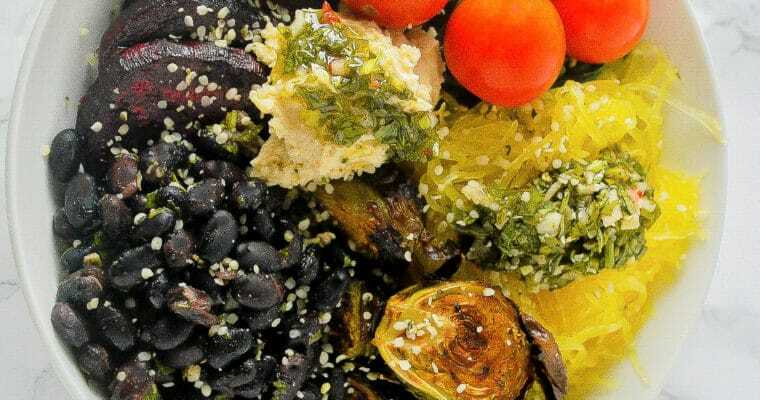 Jerk Black Bean Tacos are a quick and tasty vegan meal sure to please any taco lover. On the table in 20 mins, they are perfect for Taco Tuesday, or any other day of the week. Tacos. The universal people pleaser. I for one, have never met a taco I didn’t like. 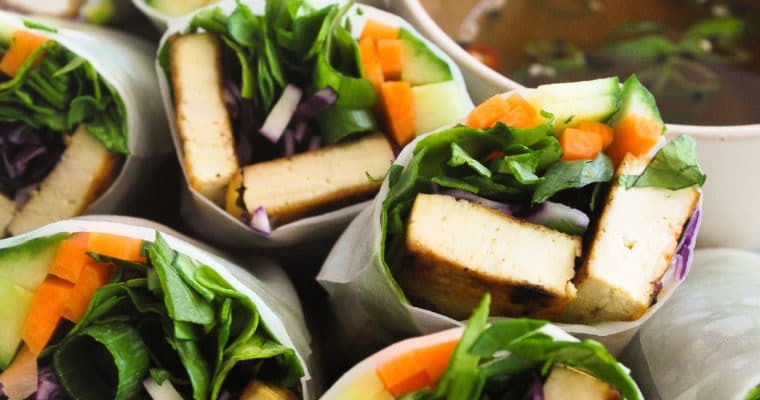 My obsession started with family taco night as a a child, grew into teenage years fuelled by Taco Bell, and now as an adult I just seem to love anything that comes wrapped in a little corn tortilla. 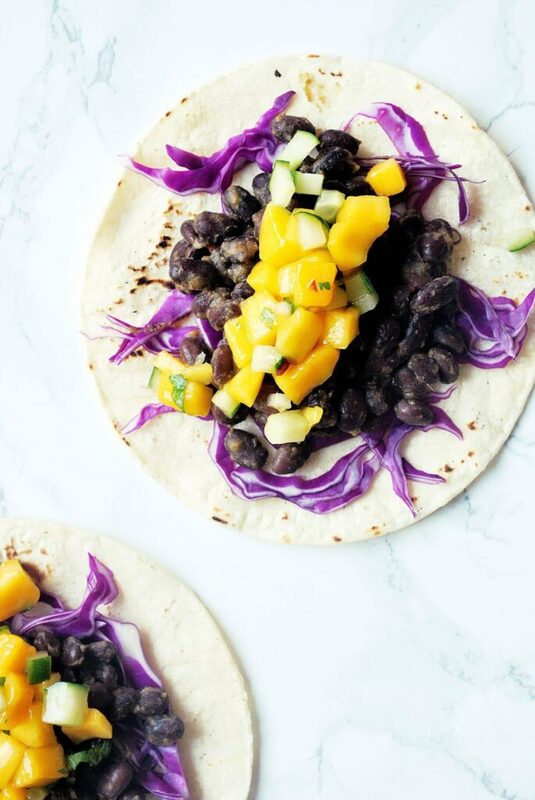 These Jerk Black Bean Tacos are easy to make, look and sound impressive, and they are a fun way to (literally) spice up taco night. The jerk paste in this recipe may look complicated, but you may have more than a few of them in your pantry already. Aside from making a few quick measurements and chops, there is not much to putting it together outside of pulsing it up in the blender. *** If you have not worked with fresh hot peppers before, please handle them with care – I wear plastic gloves while handling them. If you don’t wear gloves, be sure to wash you hands thoroughly immediately after handling them to make sure you do not spread the spicy oils from the pepper to sensitive areas on your body. Trust me, this really hurts! After your paste is made, its just a quick heat through in a pot for the black beans, throwing together some salsa, and warming some tortillas. I used two Scotch bonnet peppers in this recipe because we like things fairly spicy. 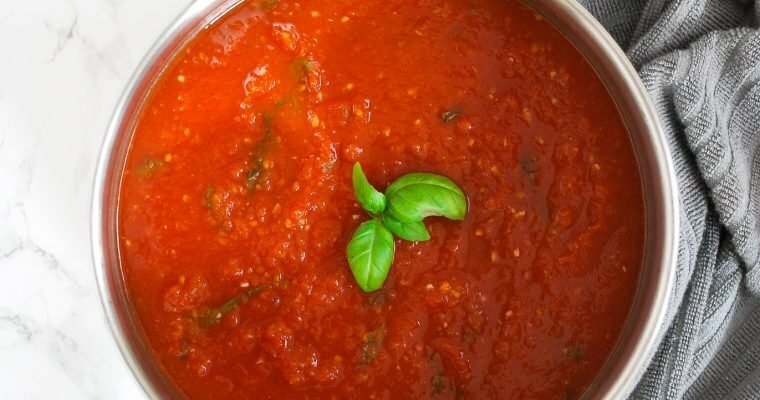 If you are unsure with how much heat you can tolerate, I suggest making the sauce with one pepper first to taste, then blending in the second pepper if it is not overwhelming. The recipe for the paste makes a fair amount, you will probably only use about 1/3 of it to make these tacos. You can keep the remainder of the paste in the fridge for a couple of weeks. Starting with the wet ingredients, place all the jerk paste ingredients in a blender and blend until smooth. Heat a medium pot to low heat, and add the drained black beans along with a couple tablespoons of the jerk paste. Heat through while stirring occasionally for 5-8 minutes - until the beans are heated through. You can add a tablespoon of water to the mixture if it is too dry. Heat a cast iron skillet or frying pan to medium high heat. Heat corn tortillas one at a time on the skillet cooking each side for about 20 seconds. 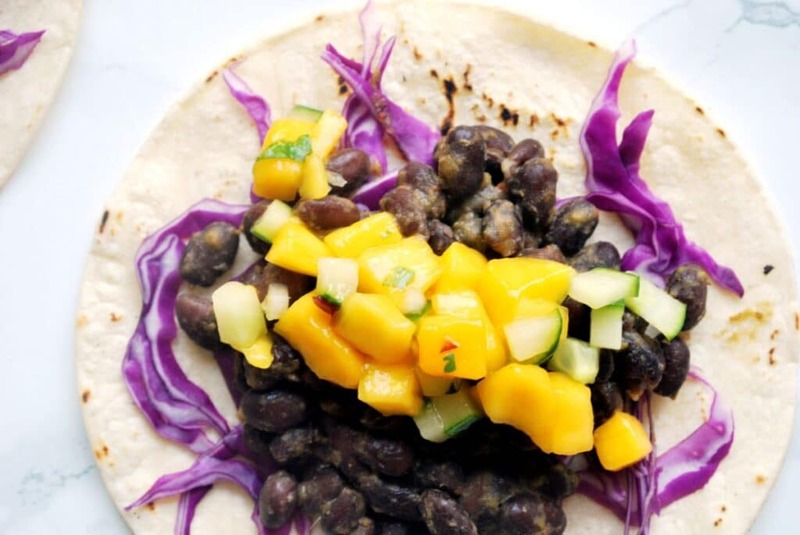 Assemble tacos by adding a bit of black bean mixture and topping with mango salsa. Amazing flavors going on in these tacos! Definitely a must make for our next taco night! I learned the hard way that you should always wear gloves when handling hot peppers. One of the most unpleasant experiences of my life! I do adore a good jerk recipe. Never made it with just beans, but I’m anxious to give this a try! That is a mistake you only make once, that’s for sure! Hope you love them! Tacos with a bit of a kick! 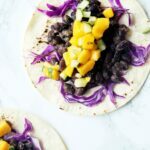 I love black beans and mangoes – combine them with jerk seasoning and I’m sold! My fiances dad just brought us a bag of scotch bonnet peppers and we had no idea what we would use them for…..now I know! That jerk paste is loaded with flavor and spice – yum! It really is! Hope you enjoy them as much as we do!